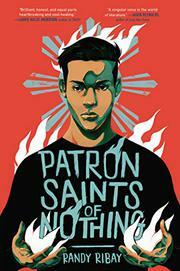 Seventeen-year-old Jay Reguero searches for the truth about his cousin’s death amid President’s Rodrigo Duterte’s war on drugs while on an epic trip back to his native Philippines. Shocked out of his senioritis slumber when his beloved cousin Jun is killed by the police in the Philippines for presumably using drugs, Jay makes a radical move to spend his spring break in the Philippines to find out the whole story. Once pen pals, Jay hasn’t corresponded with Jun in years and is wracked by guilt at ghosting his cousin. A mixed heritage (his mother is white) Filipino immigrant who grew up in suburban Michigan, Jay’s connection to current-day Philippines has dulled from assimilation. His internal tensions around culture, identity, and languages—as “a spoiled American”—are realistic. Told through a mix of first-person narration, Jun’s letters to Jay, and believable dialogue among a strong, full cast of characters, the result is a deeply emotional story about family ties, addiction, and the complexity of truth. The tender relationship between Jay and Jun is especially notable—as is the underlying commentary about the challenges and nuances between young men and their uncles, fathers, male friends, and male cousins.